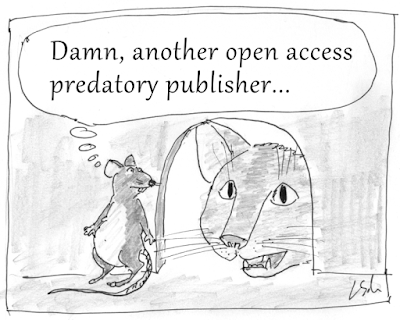 Blog de EcoSyllaba Latinoamérica: Is Frontiers a potential predatory publisher? 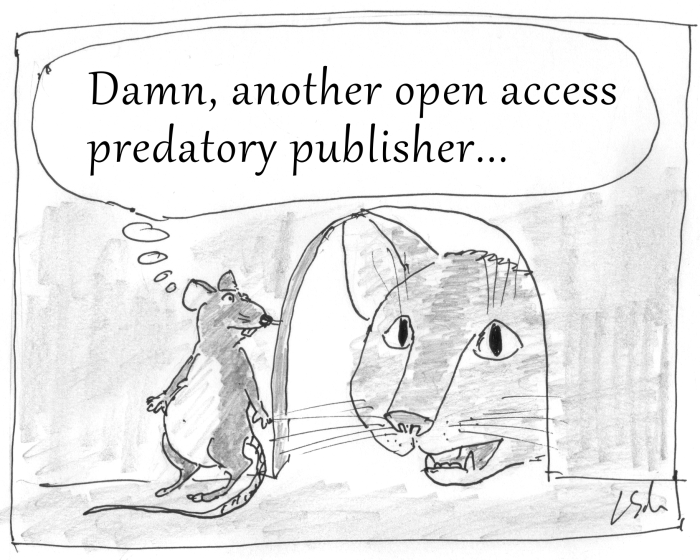 The Lausanne-based publishing house Frontiers, founded by the neuroscientists Henry and Kamila Markram, has been recently added to the Beall’s List of potential, possible, or probable predatory scholarly open-access publishers. Was this decision justified? I wish to share here some of my recent investigations. Previously, I reported about an editorial conflict at the Frontiers medical section in Laborjournal and Lab Times. In May 2015 Frontiers sacked almost all of its medical chief editors. This was because those chief editors had signed a “Manifesto of Editorial Independence”, which went against one of the key guidelines of Frontiers, namely that editors must always “allow the authors an opportunity for a rebuttal”. Associate editors are namely instructed to always “consider the rebuttal of the authors”, even “if the independent reviews are unfavourable”. At the same time, chief editors claimed to have had little, if any, influence over the editorial processes at Frontiers. Since the Frontiers Executive Editor Frederick Fenter fired all 31 signatory chief editors, Frontiers in Medicine has been operated without an Editor-in-Chief and with few Chief Specialty Editors. Medical ethics requirement for publication, originally introduced by the previous chief editors, were not implemented in the Frontiers instructions for authors. There appear to be few people in a position to provide oversight, while the associate editors handle manuscripts which they often receive directly from authors. Some of these associate editors are no strangers to controversy themselves; Alfredo Fusco, who is also a frequent author at Frontiers in Medicine, has had several of his papers retracted and is facing a criminal investigation over alleged data manipulations. The Frontiers in Medicine “purge” led me to inquire into how Frontiers’ unique editorial model works in their other journals. What I learned is that even the associate editors often find their power limited: once a manuscript has been sent out for peer review, Frontiers editors have hardly any option to reject it. This may explain how controversial papers came to be published in Frontiers, e.g. one denying that HIV is the cause of AIDS, or another suggesting that vaccinations cause autism. On the other hand, Frontiers is quite popular with many scientists and research organisations. How can a publisher which helped pioneer such innovations as open access and name-signed peer review, have come to this? Frontiers’ story began in 2007, with the first journal Frontiers in Neuroscience. One of its very first accepted articles, before the new journal was officially accepting submissions, was a theory on the origins of autism by journal founders Kamila and Henry Markram. Since then, their Intense World Theory (formerly Intense World Syndrome) has been published in various Frontiers neuroscience-related journals. There, the Markrams’ COI statement always proclaims “the absence of any commercial or financial relationships that could be construed as a potential conflict of interest”. Yet these two authors have an apparent ownership interest in the journals they publish. Henry Markram is listed as Co-Founder & Editor-in-Chief at Frontiers, Kamila Markram as Co-Founder & CEO. The mass sacking of medical chief editors suggests, they might be in a position to decide on the employment and remuneration of their editors. Meanwhile, Frontiers manages according to own website “54 open access journals, 55,000 editors, 38,000 articles”. Some Frontiers editors I communicated with were quite content with the publisher. Anne Simon, professor at the University of Maryland in the USA (and one of the whistle-blowers in the case of Olivier Voinnet, which I have been covering for Lab Times), is also Editor-in Chief (EiC) of the journal Frontiers In Virology. She describes her experience as “extremely positive“. Unlike the medical chief editors, Simon says she was never was left in the dark about submitted manuscripts or witnessed their inappropriate handling by associate editors or reviewers. “the next point of contact for editors who are having problems handling a manuscript or needing advice, and authors, who may be upset with decisions and want to contact someone other than the editor who handled the manuscript”. “we are frequently called upon to politely nudge late reviewers, when the editor and journal managers have been unsuccessful, or if there is an editor who is slow in the review process”. Maybe this is why Frontiers in Virology is one of the best cited Frontiers journals, because the chief editors are free to do their jobs? Simons clarifies: “Most journals can operate smoothly without EiC most of the time. But when something comes up, (…) then the EiC is a critical part of the journal for making decisions about exceptions to journal “rules” and dealing with papers that have possible ethical issues”. Apparently Frontiers in Medicine can operate without an Editor-in Chief, and indeed it has done for months now. But what about the ethical duties Simon was mentioning? Matthias Barton, cardiology professor at the University of Zurich and former EiC of Frontiers in Medicine and Frontiers in Cardiovascular Medicine, told me that when he and his fellow editors were sacked, their ethical policies were also shown the door. New medical ethics guidelines, which he and his colleagues had established to preserve clinical safety and patient protection, were revoked. For example, Barton and colleagues stipulated that “For each manuscript submitted, every author needs to electronically complete and sign the COI form provided by ICMJE [International Committee of Medical Journal Editors], and all completed COI forms need to be submitted with the manuscript”. Today, however, there is no requirement or even option for every author to provide a signed COI statement at Frontiers in Medicine, despite ICMJE guidelines. Instead, the corresponding author simply has to make one click to verify COI status on behalf of others. Another example of the post-purge reform: Frontiers does not distinguish in their section “Case Reports” between human and animal subjects anymore. The guidelines for manuscript submission are the same for both. No mention is made that human patient identity must be specifically respected and protected, in fact the new Frontiers guidelines there are same as for horses and cattle. The previous definition of the “Case Report”, as written by the now absent editors, was focused on human patients only and included demands such as: “Manuscripts must not include any information that allows identification of the patient. This includes, but is not limited to, names, initials, and hospital information” as well as “as anonymity cannot be guaranteed by simply covering the eye area with a black bar, the patient, parent, or guardian must be shown the photograph intended for publication, provide informed consent for its publication, and be informed by the authors that the image will be visible on the internet”. For Frontiers in Medicine, these rules are now a thing of the past. “Having a scientist as EiC who is in the same [research-] field as the journal is important for making informed decisions”. However, this does not appear to be the case for the new head of Frontiers in Cardiovascular Medicine. After the editorial purge, the journal received its new EiC, Hendrik Tevaearai Stahel, professor of Cardiovascular Surgery at the Inselspital in Bern, Switzerland. Cardiovascular medicine is a branch of internal medicine and requires an utterly different medical specialization than cardiac surgery. A heart surgeon cannot replace a cardiovascular internist. Dr. Tevaearai Stahel’s CV is rather inconclusive in the area of cardiovascular medicine than one would anticipate for the EiC of this journal. Frontiers’ philosophy is to give all authors a chance to publish their work in one of their journals. In basic science, this is, to a degree, a laudable approach indeed. Many scientists convincingly argue that every single research study should be published and judged by the scrutiny of scientist colleagues in post-publication peer review. Yet this option is not available at Frontiers, and while the reviewers are named, their peer review reports are kept confidential. This concept to publish almost every manuscript, while keeping the peer review process rather opaque, has possibly contributed to the recent placing of the publisher Frontiers on the Beall’s List. With medical studies, which go beyond laboratory experiments, the issue of proper editorial process is even more serious. Doctors adjust their patient treatments according to recent developments and publications in their field. This is why there are strict ethical rules and quality guidelines for clinically relevant medical publications, as issued by the ICMJE and the World Association of Medical Editors (WAME). Therefore, there can be many reasons for a submitted manuscript to be rejected. However, at Frontiers, the rejection option is not always available. Generally, a peer reviewer can only withdraw from the peer review; recommending rejection is not an available option. If a reviewer does withdraw, the handling editor is automatically prompted to find a replacement reviewer. Theoretically, this can go on back and forth until two positive peer reviews are finally obtained. Occasionally, associate editors skip the search for willing reviewers altogether and perform the peer review themselves. “The piece in question was lacking very basic aspects of a scientific manuscript and the authors failed to make any amends. I made it very clear at the first response to the authors that the paper was unacceptable in this format and although they made some small changes, they did not address any of my major comments. The subsequent rounds of “revisions” were getting nowhere and as there was no option for me to reject the manuscript in the online review system and the Editor couldn’t make this decision as he was forced to give further “chances” for improvement, I felt that I had no other option than to withdraw from the process as the authors were clearly not willing to understand”. “From a reviewer point, there is no opportunity to reject a paper, only to endorse or ask for further revisions”. “once a paper is sent for peer-review, we want to give the authors the chance to discuss with the reviewers in the interactive review stage. You can always reject a manuscript BEFORE [caps in the original] sending it to reviewers/review editors”. “Regarding rejecting before interactive review: the reason we strongly discourage this is because Frontiers wishes to overcome one of the common concerns that authors have – that the editors have overruled their chance to discuss their paper with the reviewers”. This sounds somewhat like a Catch-22 situation, in which the very act of sending out a paper for peer review precludes the ability to reject this paper on the basis of the review, should it turn out negative. The resulting high acceptance rate at Frontiers goes hand-in-hand with the fact that the publisher has offered its chief editors a reward of €5,000 “for each batch of 120 papers submitted to your section in 2015”. Yet under certain conditions, Frontiers has no problems with rejections at all, even of positively reviewed manuscripts. Lydia Maniatis, formerly adjunct psychologist at the American University in Washington DC, had such an experience. She submitted a rather critical Commentary (a publication type generally published by Frontiers free of charge) on a certain Frontiers in Human Neuroscience article which dealt with visual shape perception. Her manuscript was assigned an associate editor, but soon rejected. The reason was: despite one endorsing review, another reviewer chose to wordlessly withdraw. No specific criticisms from this reluctant reviewer were forwarded to Maniatis. No replacement reviewer was appointed, despite Maniatis’ many requests. Instead, the associate editor reviewed the manuscript himself, despite being a child psychologist and autism specialist rather outside the field. He decreed that Maniatis’ revised manuscript was “not adequate and lacked clarity and focus”, without providing any further explanations. With the support of the journal’s Chief Editor, the rejection was final. Maniatis later published her criticisms on PubPeer and PubMed Commons and was finally able to engage with the authors of the paper. After Frontiers was listed as a potential predatory publisher, Nature News has reported on the scientists’ protests about this addition to the “controversial ‘Beall’s List’”. The Nature Publishing Group (NPG) is owned by the German publishing house Holtzbrinck Publishing Group, which is also the partial owner of Frontiers. Indeed, as I reported for Laborjournal and Lab Times, NPG became a major stakeholder in Frontiers, publicly much celebrated by both publishers. Then, at the beginning of 2015, a break came. NPG representatives have left the Frontiers board, with Henry Markram taking over their duties. The current administrative board lists the Markrams, some Frontiers employees, the reviewing board member PricewaterhouseCoopers (USA), a representative from the private equity firm CVC Capital Partners (Luxembourg), and Michael Brockhaus, Head of Group Strategy at the Holtzbrinck Publishing Group. I have reached out to Brockhaus, through his personal assistant, for a comment on the nature of Holtzbrinck’s financial involvement with Frontiers, yet received no reply. One could assume that NPG has sold or withdrawn their investment in Frontiers, however one fact suggests that there has not been a total financial divorce: Nature journals keep advertising for the Frontiers-owned academic social network, Loop, by posting links to authors’ Loop profiles (which are created automatically for all Frontiers authors) on their article websites. Certain editors told me that they did not succeed in having their Loop account fully deleted. Loop may help Frontiers and NPG scientists to connect, but not every account belongs to a bona fide user. The network contains a number of obviously inappropriate or bogus accounts, and Frontiers has been informed by then-EiC Barton about certain questionable Loop profiles. Some, such as the profile “Isha FB1 TEST Jan” (whose only content was a photo of a pornographic film actress) were removed, but others remain active: an Indian “Genius Mind”, a US professor by the name of “Alpha Shred”, a teenage professor from Macedonia, a Chinese senior researcher “Eagle Eagle Jg”, a student of a geographically bizarre “Amedeo Avogadro University of Eastern Piedmont” in Lebanon, and finally a US based CEO called “mis souri” whose speciality is the “wonderful sport of duck hunting”. Frontiers thanked Barton in January 2015 for sharing the information on these strange researcher profiles, but has yet to remove them. Regardless their publishing and editorial policies, Frontiers journals have recently joined the Committee on Publication Ethics (COPE) en masse. Coincidently or not, prior to this the Frontiers journal manager Mirjam Curno joined the committee as council member. While most other journals list their editors-in-chief as their COPE contact, none of the listed Frontiers journals does. Instead, their COPE contacts are exclusively the employees of the publisher, working in managerial capacities – and not involved in the editorial process of the journals. Some of these employees have little experience in the research fields they are now supervising. One is a former earth scientist, now in charge of veterinary science, neurology and psychiatry. Another studied English and Croatian at university but is now an oncology, endocrinology and public health specialist. Yet another, who supervises several Frontiers life science journals despite having studied earth sciences, has no PhD. In fact, a number of Frontiers journal managers carry no academic credentials beyond a bachelor’s degree, in a field unrelated to their Frontiers duties. All of this would not necessarily be a problem if these managers were assisting and answering to the senior academic editors of their respective journals. Instead, as the sacked medical chief editors have experienced, these journal managers interfered with the editorial process, by occasionally advising these editors to keep recruiting further reviewers or dissuading them from rejecting a manuscript. Editorial independence, free from the meddling of the owner and publisher is a key principle of good editorial practice in science publishing, as stipulated by highly respected organizations such as ICMJE and COPE. Shortly after sacking its editors, Frontiers listed its medical and other journals as “Following the ICMJE Recommendations” and, as mentioned, became member of COPE. These events however do not mean that Frontiers is bound to change its internal policies. Why? Simply because both organizations seem not to mind when those who publicly subscribe to their rules don’t actually consider adhering to them. The author wishes to thank NS, RP, PSB, SC and JB for their critical comments on this text.